Have you ever wanted to attend a street festival right in your back yard? Have you ever wanted to experience all of the different variety of foods Jonesboro & Clayton County have to offer? Have you ever wanted to dance in the middle of the street? If your answer to any of the above questions is yes, then we have the Ultimate Street Party for you! 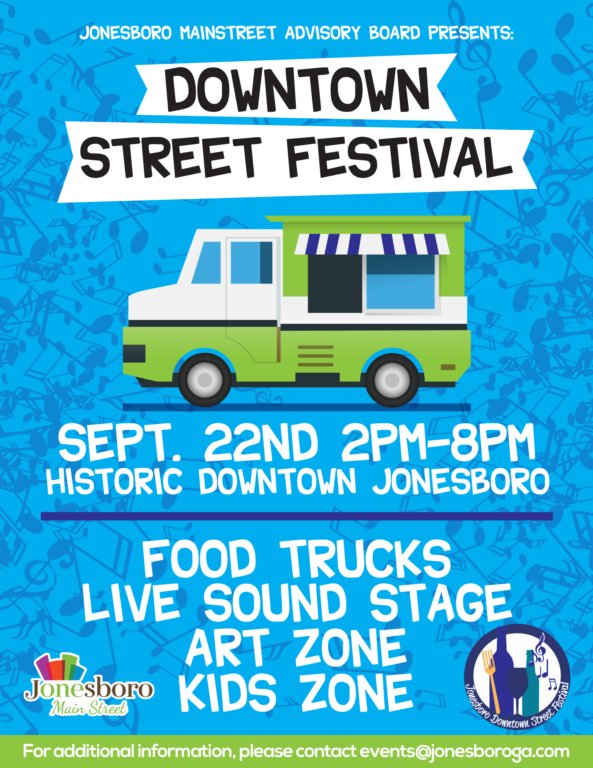 Join us on September 22rd from 2:00 p.m. noon - 8:00 p.m. for our 3rd Annual Downtown Street Festival. Last year, we had about 5,000 people attend. This festival will feature a wide plethora of different food truck options, street vendors, kids play zones & of course, "LIVE MUSIC!" We anticipate even more attending this event and it wouldn't be the same, without YOU! If you haven't already obtained your tickets, please do so today! This is a festival that you do not want to miss.